This post was inspired by Molly...who gets to hear what I have to truly think about a recipe or a tough night of baking. About the coconut key lime pie bars from last week: "They were so frustrating. I could not stop these from falling apart." I had whipped cream everywhere! About the cinnamon roll whoopie pies: These elicited a small dance. "They came out exactly like I hoped they would!" About the Maple Bacon Donuts: I had to basically pry these out of the pan. I definitely did not spray these pans with enough non-stick cooking spray. They caused me to be a bit late for work, but I had donuts with me. About this apple strudel: "It took too d*mn long." Truthfully it only took about an hour and a half. I was just tired after work and going for a run. You see the thing is I do love baking, seriously I do. Sometimes though, I try to do things in a rush, when I am a little too tired after work, or when I try to fit in baking in the hours before work. Sometimes I just try to do too much, and I underestimate the time things will take. Through my frustration though I am able to test the recipe, and figure out how to change it and explain it so that you hopefully won't have those same frustrations. I am learning though, and sometimes delicious, beautiful things require a little bit of a challenge. Like this strudel for instance...it was well a challenge. The recipe didn't really go according to plan...I had WAY too many apples. As in I ended up just baking the left over apples so that they wouldn't go to waste. The strudel was delicious though! The phyllo dough is crisp and tender all at the same time. The apples are sweet, cinnamony and baked to perfection. The raisins are plump and add great flavor; with the walnuts adding wonderful crunch. I will definitely make this recipe again...I just won't cut up so many apples next time. Enjoy! Loving my new cookbook that "spells" everything out with pictures, while explaining why the recipe is exactly the way it is. The filling...really what makes this apple strudel simply delicious is because the ingredients are simple. They then get wrapped and tucked, and well covered with just a little more butter. Plus, don't forget to cut air vents in the top...these apples need to breath while they bake. Fresh out of the oven, this strudel smells amazing! 1. Heat the raisins in a microwaveable bowl with the water or apple cider covered with plastic wrap for 45 seconds. Remove from the microwave and let stand until needed. 2. Melt 1 tablespoon of the butter in a small skillet over medium heat; when the foaming subsides, stir in the bread crumb and cook, stirring frequently, until golden brown, about 2 minutes. Transfer the bread crumbs to a small bowl and set aside. 3. Peel, quarter and core the apples; cut each quarter lengthwise into 1/4-inch thick slices. 4. Adjust an oven rack to the lower-middle position. Preheat the oven to 475 degrees F. Line a baking sheet with parchment paper. 5. Drain off and discard any remaining liquid from the raisins. 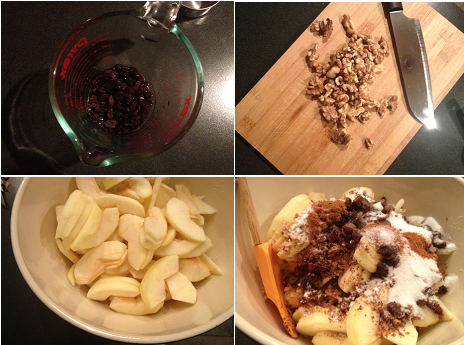 Toss the apples, raisins, bread crumbs, 1/4 cup of sugar, the walnuts (is using), cinnamon, salt and lemon juice in a large bowl to combine. 6. Melt the remaining 5 tablespoons of butter. Place a large sheet of parchment paper horizontal on a work surface or use a cutting board. Place 1 sheet of phyllo dough on the work surface, brush liberally with melted butter, and sprinkle with 1 teaspoon of sugar. Repeat with the remaining 4 sheets of phyllo dough. 7. Place the apple filling in a three inch strip about 2 1/2 inches from the bottom of the phyllo, leaving about 2 inches on either short side. Fold the ends of the phyllo over the apples. Fold the end closest to you over the apples and continue rolling loosely, using the parchment paper as a guide. Don't roll too tight, as this can cause tearing during baking. 8. Place the finished strudel, seam-side down, on prepare baking sheet. Brush the strudel with the remaining butter and sprinkle with remaining 1 teaspoon of sugar. Cut four 1-inch vents into the top of the strudel for the seam to escape. 9. Bake for 15 minutes or until golden brown. Cool on baking sheet on a wire rack until warm, about 45 minutes. Serve and Enjoy!